Donkeylicious: Renters Of The World, Unite! Renters Of The World, Unite! There's a nice article from Jeanne Sahadi about the mortgage interest tax deduction, the costliest tax break in America. The Yahoo! 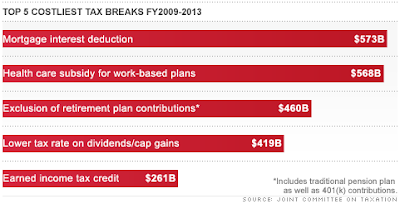 front page now has a link to it that says "America's best tax break." I lean closer to the view of Tony Vila, who writes, "it is the bads." Sahadi's article also had the nice chart at right, which shows how big a hole this deduction is cutting in the budget. Obviously, this is a wildly regressive deduction. 75% of the revenue goes to filers with incomes over $100,000. 32% goes to households with incomes over $200,000 (though they account for only 11% of returns claiming the deduction). People can deduct the interest on loans up to $1 million, and on home equity loans up to $100,000. I don't see why we care about encouraging homeownership over renting in the first place, and I especially don't see what our interest is in helping people get tax deductions on home equity loans. As Sahadi and everyone writing on the topic except Mark Calabria at CATO says, the homeowner lobby has enough political power that any attempts to seriously rein in this deduction are going to fail. The two ideas that come up in the article are (1) capping the deduction and (2) converting it into a credit. I wonder if we could at least clip off the home equity loan deduction bit, though that probably doesn't account for a whole lot of revenue. I've heard a lot of people say that Congressmen's issue positions are determined primarily by the rich people in their district -- the donor class -- and not at all by the views of the bottom third of the income distribution. Renters, I'm guessing, are more concentrated at the bottom, and that's why the government has decided to systematically disadvantage them. At the peril of going all "Don't think of an Elephant" on you, I think there is an interesting linguistic point to be made here. If I instituted the "buy everyone a hot dog on july 4th" government program, that would be increasing bad government spending; if instead I gave out a refundable tax credit for the cost of your july 4th hot dog if you could present a receipt, that would be a noble tax break. There's lots of comparable stuff in the tax code. Inasmuch as the long-term budget needs to be balanced, taxes need to go up and spending needs to come down and an appreciable fraction of the country hates anything that raises taxes. I suggest therefore that we on the left do a little Luntzian rebranding: the mortgage interest subsidy, not the mortgage interest tax deduction. The r&d subsidy, the employer health insurance subsidy, etc. Let's call things by names that reflect their economics, not their implementation. The budget deficit will come down if there is more economic growth and if that growth generates middle class incomes. The notion that the budget deficit is to be brought down by generating a double dip recession through tax increases and spending decreases is, of course, so laughably absurd that it is accepted as truth by the Village. Conversion of the tax subsidy for the rich into a middle class and working family tax credit might at least marginally push in both of those directions, so that would at least have a chance of being more effective than the "let's have another recession" strategy for "balancing the budget". In the long run the deduction doesn't even benefit home owners, since it just comes out in higher housing prices -- the prices increase to what the banks will loan. The problem is unwinding the higher housing prices. People who currently own homes paid more for them because of this subsidy, and removing that support too quickly isn't going to be good for the economy. Removing the subsidy during the next housing boom might be a good approach. That is a good point. Our current policies raise the cost of owning a home for the middle class while reducing it for the upper middle class and the rich. -"big a hole this deduction is cutting in the budget" Why not look at this from the perspective of finding an equal offset to reduce the budget? -A "wildly regressive deduction where 75% of the revenue goes to filers with incomes over $100,000, 32% goes to households with incomes over $200,000" Well, this makes sense as we currently have a "wildly regressive" federal income tax. The top 1% currently pays a third of the federal income tax revenue. The top 25% pay 85%. As such, it makes sense they would find greater benefit. The bottom 50% pays slightly over 3% in federal income taxes - many of which pay nothing or receive excess in credits. Do they deserve even more tax credits from the gov't? -"I've heard a lot of people say that Congressmen's issue positions are determined primarily by the rich people in their district -- the donor class -- and not at all by the views of the bottom third of the income distribution. Renters, I'm guessing, are more concentrated at the bottom, and that's why the government has decided to systematically disadvantage them." Wow…really? The bottom third pays ZERO income tax and conversely receives tax credits (i.e. earned income credit). The fed cuts these bottom third checks every April. Where's the disadvantage in collective 97% of the tax revenue from the top 50% and paying substantial portions out to the bottom third? The bottom third pay pay a greater percentage of their income of their taxes than the top third do through sales taxes and payroll taxes. "The bottom third pay pay a greater percentage of their income of their taxes than the top third do through sales taxes and payroll taxes." Sure, they may (or may not) pay a higher percentage in sales taxes and payroll taxes (irrelevant) as a subsection. However, the bottom 40% pays less than 5% of their total income in ANY form of tax (i.e. Federal, State, Local, Payroll, etc). Because payroll taxes are paid in Monopoly money, I suppose. When you remove "as a subsection" from my quote, you've proven it leads to a funny joke. My point was clearly not that these taxes are irrelevant, but when you can encompass all or TOTAL taxes paid -- identifying one subsection that has a higher or lower percentage becomes irrelevant.